The flight path to the Moon can be difficult to visualise. Imagine a vantage point looking down at the Earth and Moon from the north, with an Apollo spacecraft about to make a TLI burn for a free-return path. The spacecraft had been orbiting Earth towards the east (anticlockwise in our visualisation), a direction it shared with the rotation of Earth, and indeed almost everything else in the solar system. The TLI burn was timed to occur at a point in this orbit that was roughly on the opposite side of Earth from where the Moon and spacecraft would come together three days later. The burn placed the spacecraft on a path that ordinarily would have been a long, slow elliptical orbit with an apogee half a million kilometres out from Earth, which is slightly beyond lunar distance. Meanwhile, the Moon at TLI was about 40 degrees further back in its path around Earth, approaching the point where its orbit would intersect the spacecraft's path. The timing of TLI was such that the spacecraft would reach lunar distance before the Moon came along. As it headed out, the influence of Earth's gravity on the spacecraft gradually weakened while that of the Moon, approaching from the side, grew stronger; attracting the spacecraft and deflecting it from its original anticlockwise elliptic path. 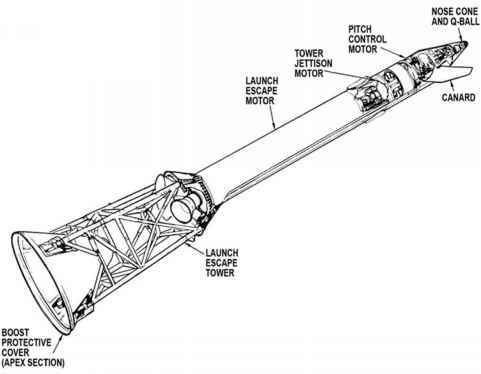 By virtue of careful calculation of the required trajectory prior to the TLI burn, the spacecraft was aimed to pass close to the Moon's leading hemisphere and be pulled around its far side travelling in a clockwise direction. If nothing else were done, and if the timing and direction were correct, such a trajectory, under the Moon's gravitational influence, would swing right around the lunar far side and fall back to Earth. Such a path made its closest approach about midway around the far side, so in order to stay in the Moon's vicinity, the crew had to fire their main engine against their direction of travel at this point. This burn took energy out of the spacecraft's trajectory, slowed it down and made it enter a clockwise, or retrograde lunar orbit.